Egregious Debt? Just Print More Money. The fiat currency of the Federal Reserve has no inherent value. The value of the dollar comes with what it can buy and the more money you print then the less each dollar in circulation is worth. What Greespan ignores is that money is no end but a means to the real end of property and services. Money is our barter chip for the goods and services we desire so what good is the barter chip if it doesn’t stand for something? Alan Greenspan may be technically right in theory that we could print the money to pay off our debt but it would probably take a lot more than 15.5 trillion dollars to do it and, worse, it would devalue the dollars of every American everywhere. Thats essentially a tax on your wealth – a tax never voted on by Congress and never established in law, a tax so insidious you would never know it were there except for the rising prices around you. If we were to print the money needed to pay off our debt then maybe we could get away with it – but the dollars in your pocket would no longer be worth the cotton its printed on. America has enemies. Some of these enemies, terrorists, have already done great harm to our nation. The worst terrorist attack against us, 9/11, killed over 3,000 people, left an entire nation in fear, and lead to two simultaneous wars each lasting a decade. Yet, what if the American people had an enemy that is quickly compromising our safety and stripping our freedoms away faster and more efficiently than terrorist groups ever could? Worse, what if this enemy wasn’t thousands of miles away but resided right here at home? As bad as terrorism is, the tactics we have used in retaliation have done more harm than the terrorists ever did. Enemy number one is the War on Terror itself. The PATRIOT Act was passed as a legislative tool to fight terrorism. However, it violates not one but three amendments of the constitution. The rationale? In order to protect ourselves from freedom-hating terrorists we must strip away some of our liberties first in order to fight the war on terror more effectively. This is something no terrorist have ever been able to accomplish but thanks to the Bush administration we have friends in office willing to do the terrorists’ job for them. However, the Obama administration has continued the Bush legacy in true bipartisanship form. Recently, Obama retracted his promise to veto the NDAA bill, which authorizes the indefinite detention of American citizens without trial under pretext of potential terrorism, instead signing it into law. He signed a statement saying that he has no intention of ever using this tyrannical power because he has grave reservations against it. However, this signed statement is not a legal document, he can change his mind at any time, and his successors retain the full power to indefinitely detain essentially whomever they please. Note that some of the parameters that constitute “potential terrorist” include such things as having more than a week’s supply of food in your house, possessing weather-proof bullets, missing a finger, or belonging to a pro-life group. 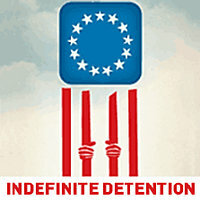 Detainment of even a single person under these pretenses is a violation every American’s inalienable rights that preexist our government and are recognized by our constitution. Even the possession of this kind of power by the executive branch is contrary to democracy and an insult to every American. In addition to stripping our liberties the war on terror has posed a massive financial burden on the country to the point that America’s (now retired as of Sept. 30 2011) top military officer, Admiral Michael Mullen, chairman of the Joints Chief of Staff, stated that, “I actually think that the biggest threat to our national security is our national debt.” The war on terror has contributed massively to this debt: America spends more on military than the rest of the world combined at 1 billion dollars a day. With increasing threats of war against Iran – again under the pretext of national defense and countering terrorism – that expense can only be expected to increase. But at the high price of our liberty and our hard earned dollars at least we’re safe from terrorists and a repeat of 9/11, right? Unfortunately, nothing could be further from the truth. Estimates show that the Iraq war has led to a sevenfold increase in fatal terrorist activities around the world. This can be explained by the principle of “blowback” a CIA term referring to unintended consequences to America’s interventions abroad. The war on terrorism has resulted in substantial blowback, proliferating anti-American sentiment and uniting much of the Muslim world against us. That’s the problem, but what’s the solution? First, we need to cut out losses and end the war on terror. With military bases in 116 countries around the world its time to bring our troops home. We need to end our wars, reverse the PATRIOT Act and the NDAA, cut military spending, stop foreign aid to tin pot dictators, and open negotiations with Iran now before we start yet another war. By taking a non-intervention approach and eliminating blowback alone we will accomplish more in the fight against terrorism than we have in the last decade – and all without the cost to American freedom and livelihood.